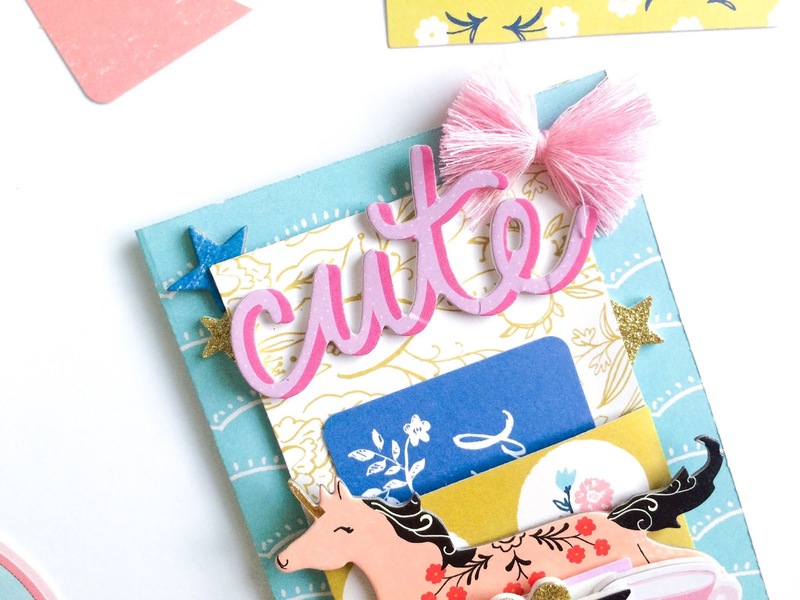 One of the simplest, yet meaningful crafts are handmade cards! I'm sure I'm not the only one that smiles wide when I receive a card in the mail. A card - handmade or not - is a sweet way for someone to share a piece of their heart, no matter how simple or small. 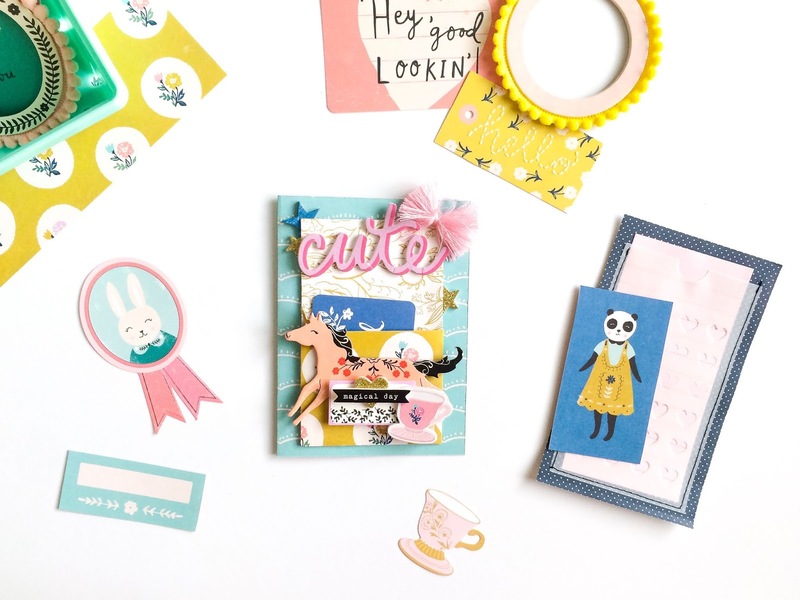 What I love about scrapbooking cards for others is that I can personalize and create my card based on the person I'm making it for. Card making is quite easy, and the possibilities for creativity are endless. Often, I will keep my cards rather simple overall. Other times, I may implement a more detailed or interactive element. Today, I'm sharing a more interactive card using the Crate Paper & Maggie Holmes Willow Lane collection! 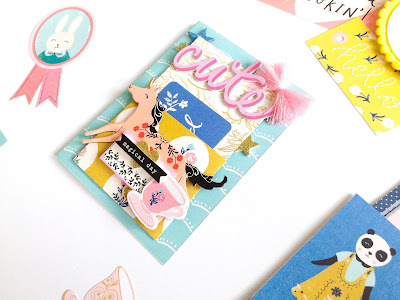 A fun and easy way to spruce up a card is to add an interactive pocket! That's what I decided to do for this Willow Lane card. I wanted to create a whimsy feel and have a little surprise phrase card tucked inside. To do this, I chose one patterned paper to use as the base of my card. For the pocket, I chose two additional patterned papers. I used these two to create an upright rectangle shaped pocket. I then adhered the pocket directly to the center of my card! I used some thicker double sided adhesive so the pocket was slightly elevated. Inside, I tucked in a sweet "You Are Loved" ephemera card. If you know my style, you know I love creating dimension & embellishment clusters! On the front portion of the pocket, I decided to create a whimsy embellishment cluster. I used a variety of pieces including chipboard, thickers, and paper ephemera. 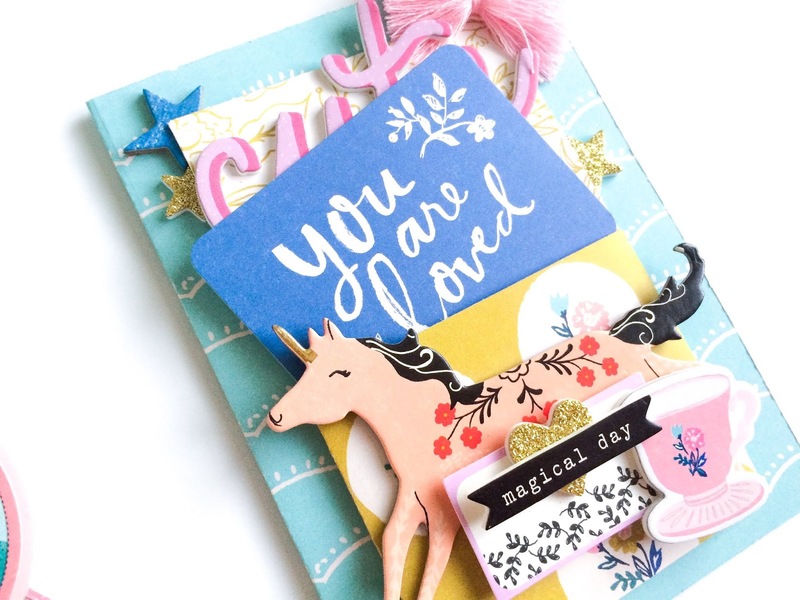 I really loved the unicorn from the chipboard sticker sheet! It worked perfect to create that whimsy vibe I wanted. It also added a beautiful pop of color! So I decided to use it as my base sticker, and layered more thickers and ephemera on top. I used the little purple ephemera label popped up on some foam dots. Then I added a beautiful gold glitter thicker heart, a pink tea cup thicker, and topped it all with a "Magical Day" thicker! This added perfect dimension to make this card more interactive. On the top backing of the pocket, I adhered the "Cute" phrase from the thicker sheet. Toward the right corner, I also stuck down one of the adorable pink thread bows! This added another element of texture and dimension. And finally, I tucked some gold thicker stars and a blue chipboard star behind the backing of the paper pocket. I am so happy with how this sweet whimsy card turned out. And the best part about it is that it can be given for any occasion. That's one thing I love about card making - you really don't need a special occasion to love on someone with a handmade card. You can make a card, or several, and save them for every-day moments you want to love on someone special. It is sure to be a sweet surprise that will bring a smile to your recipient's face! 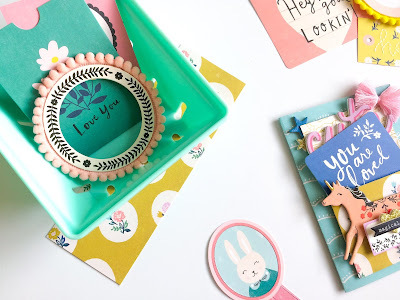 Whether you want to show appreciation to a coworker, to let a friend know you're grateful for them, to remind your sister that you're thinking of her, to love on your Mom just because, or to encourage someone going through a tough time - handmade cards are a simple, but powerful way to spread joy and to love on others. It's also such a fun way to get crafty and be intentional about savoring your relationships with the people that matter the most. Let me know what kind of cards you like to make in the comments below! I challenge you to create a "just because" card like this one, and to gift it to someone you want to love on.